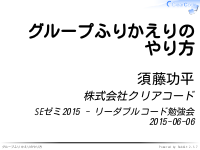 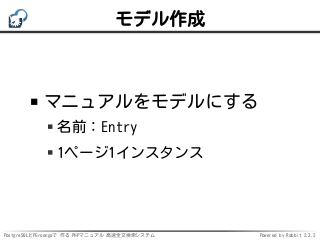 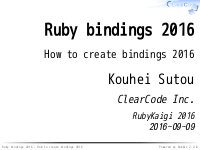 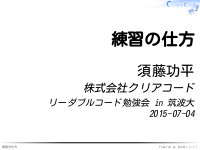 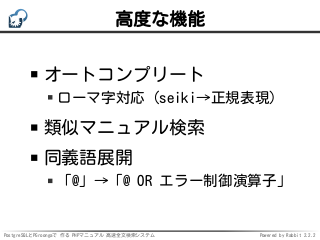 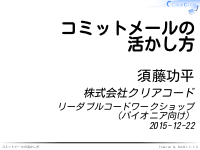 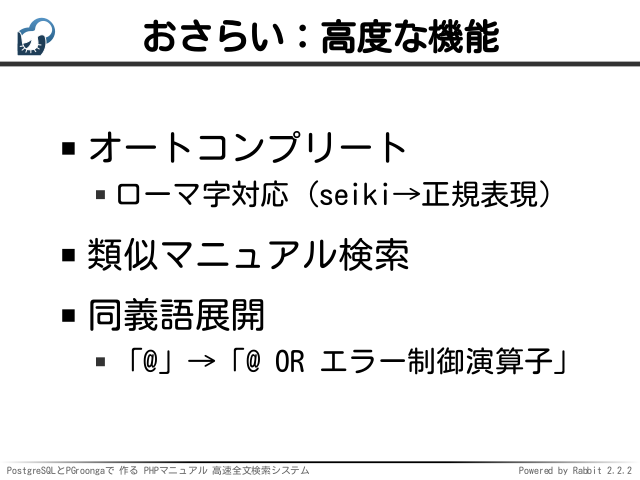 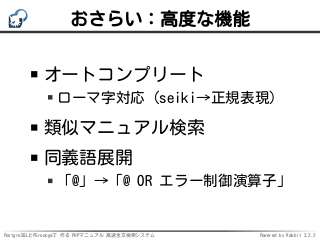 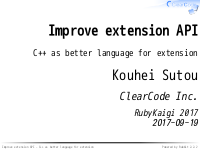 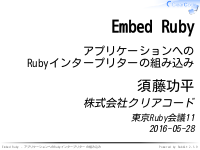 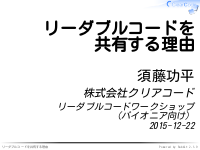 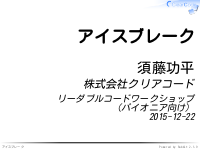 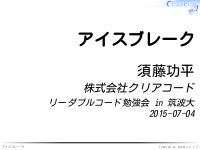 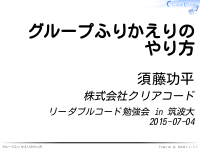 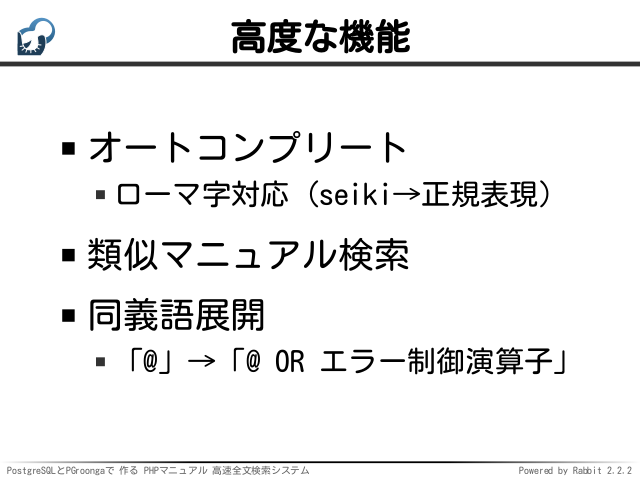 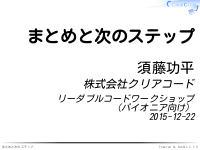 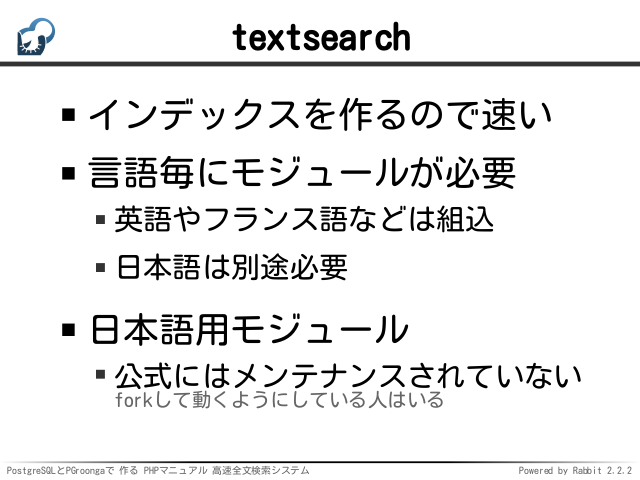 "CREATE INDEX terms_term_index " . 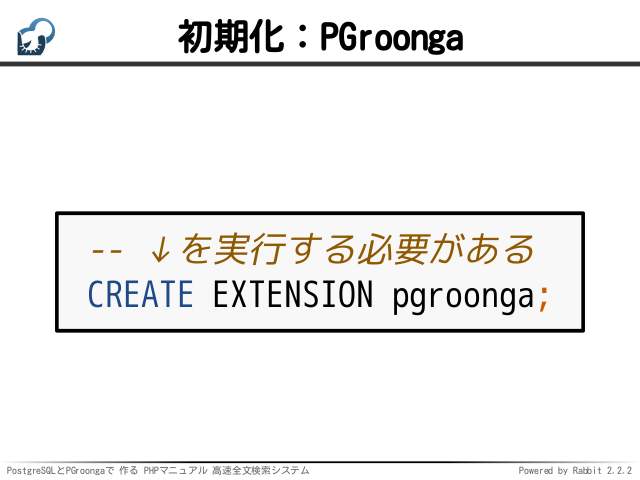 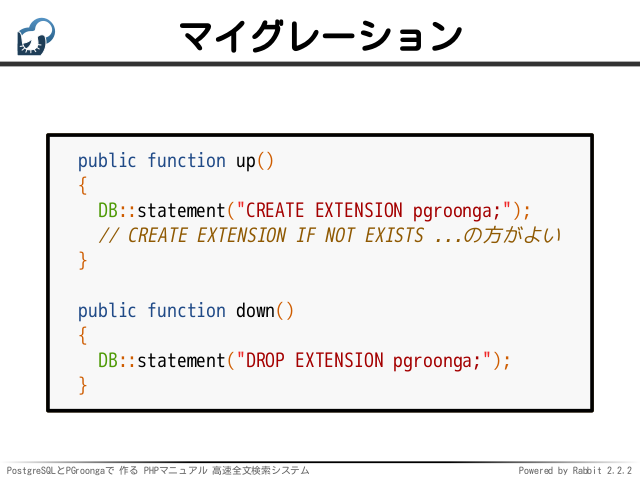 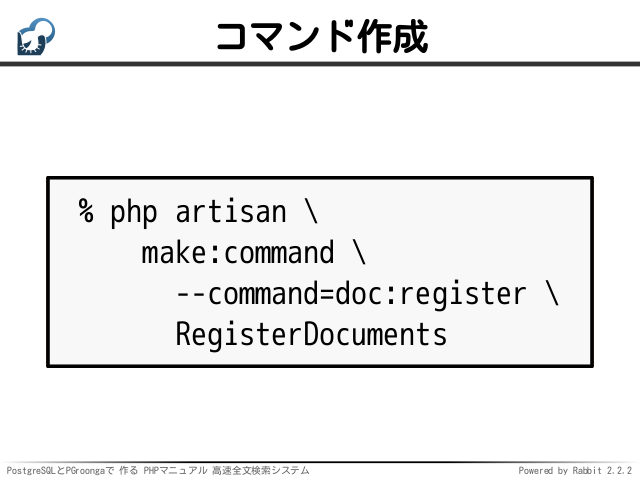 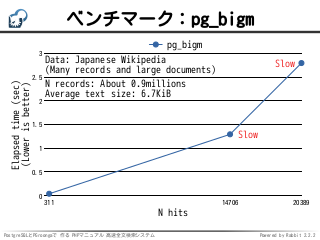 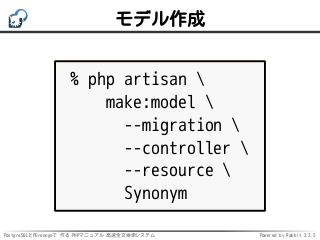 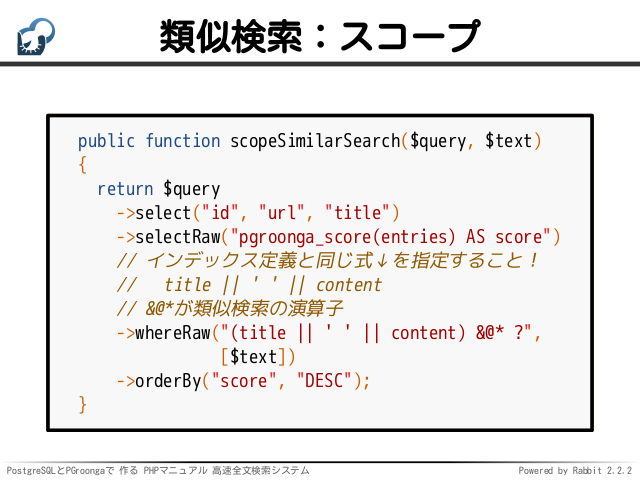 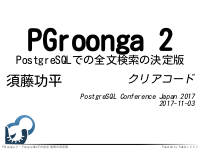 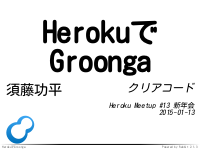 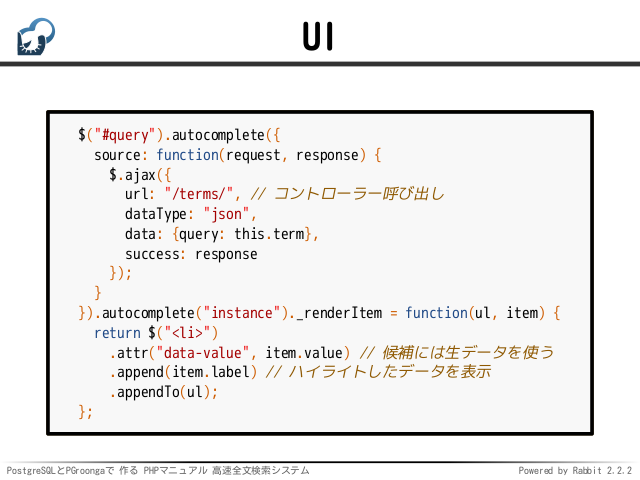 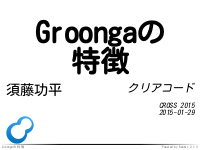 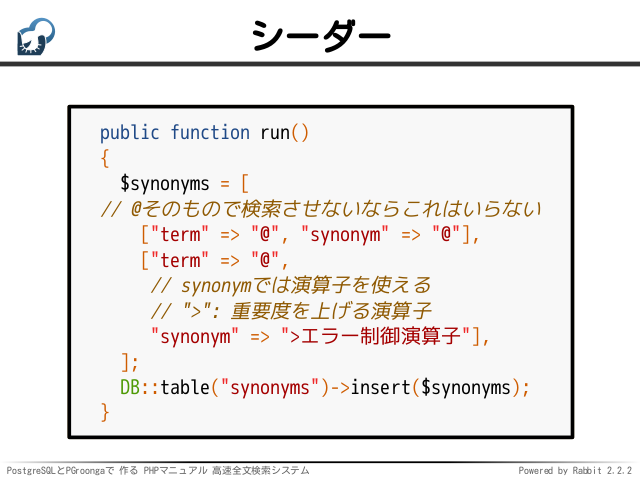 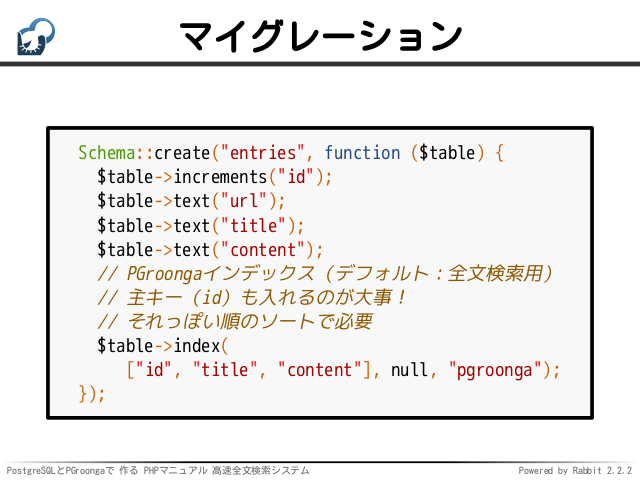 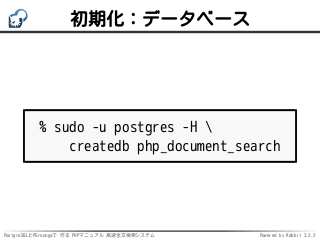 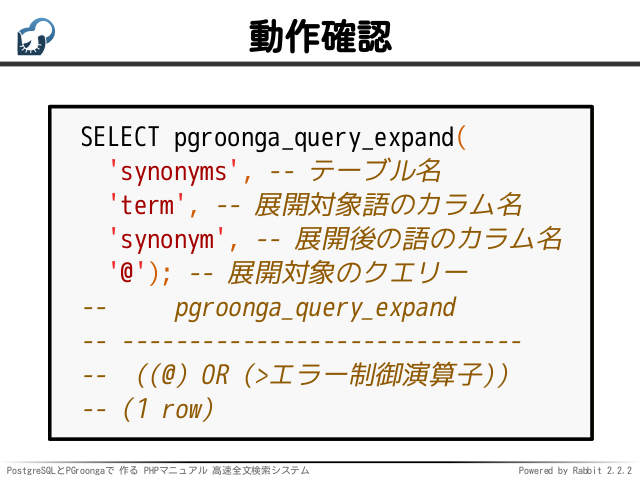 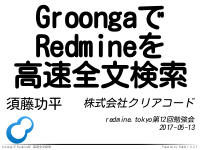 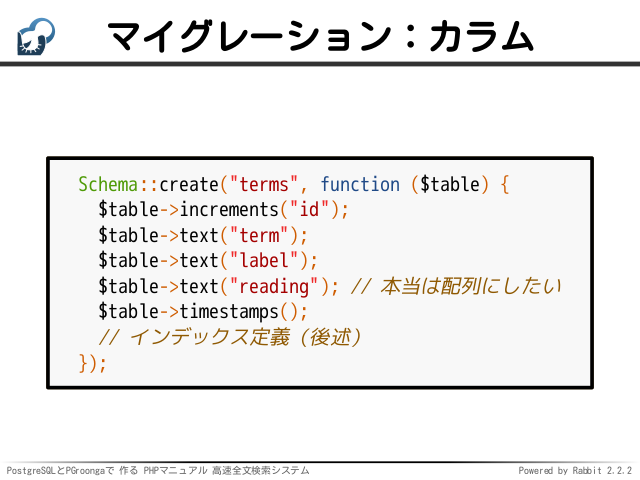 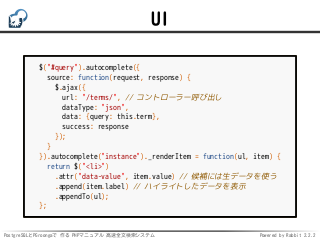 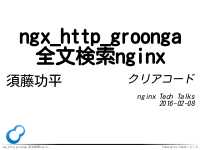 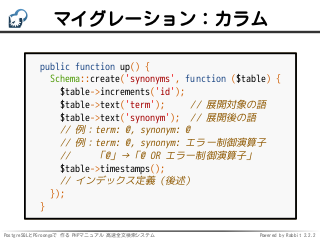 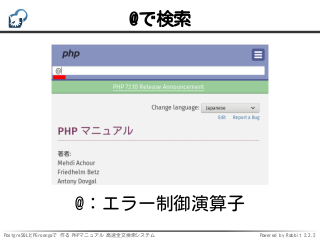 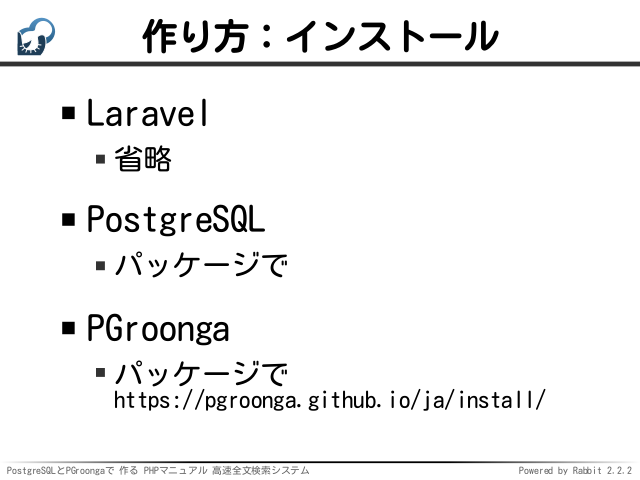 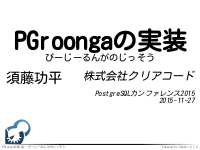 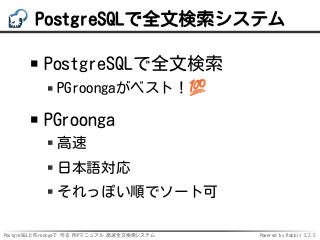 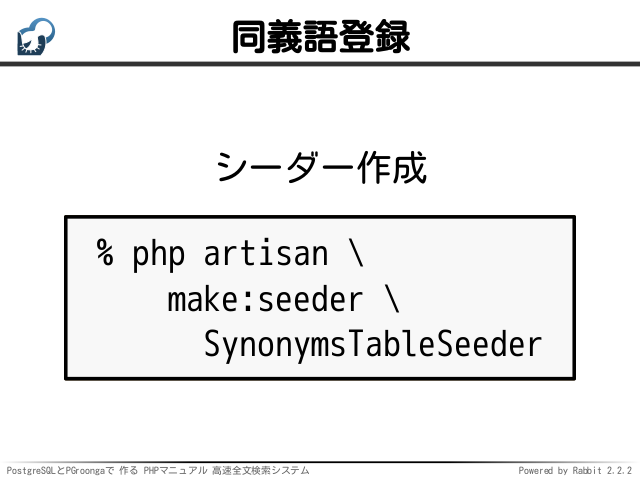 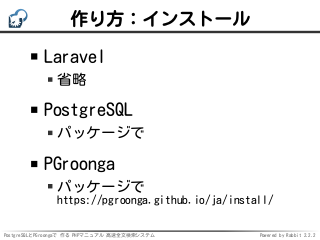 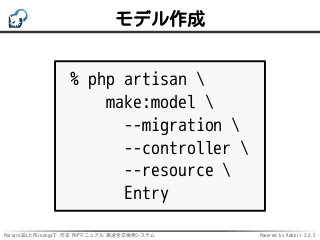 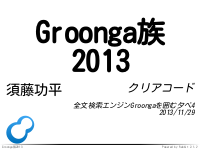 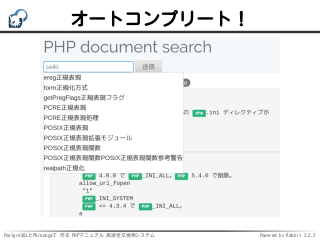 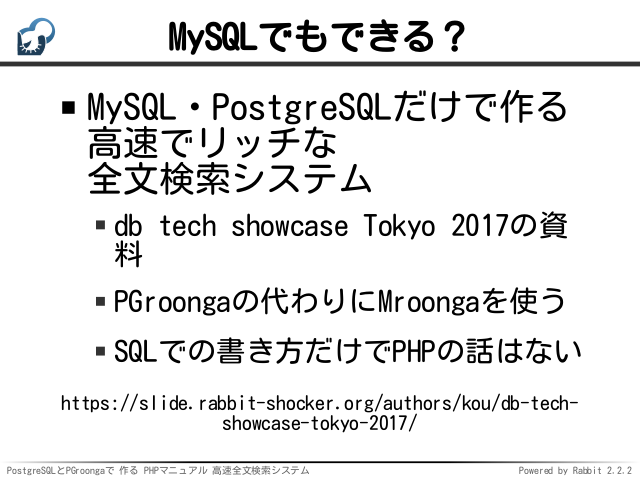 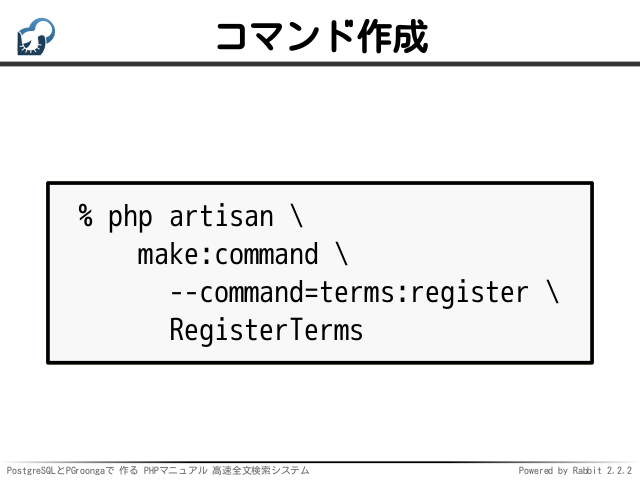 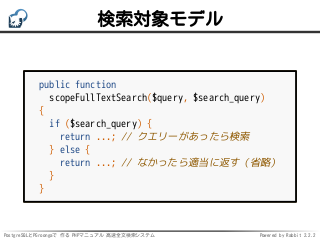 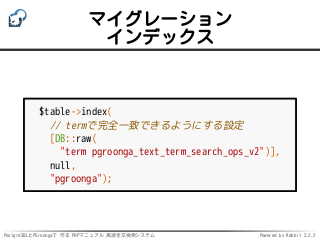 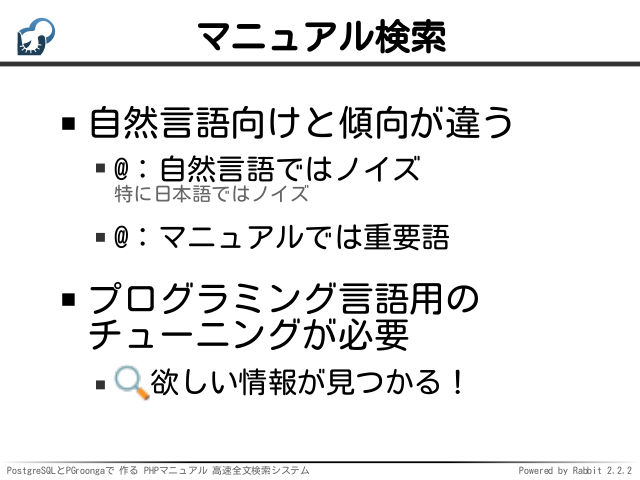 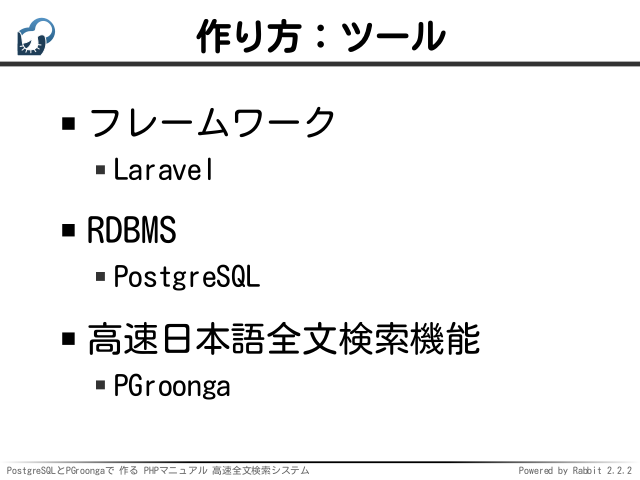 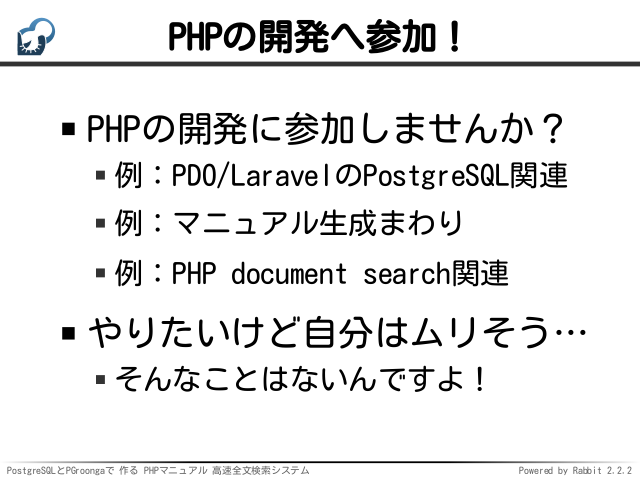 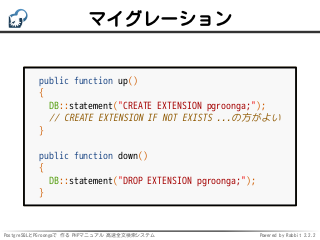 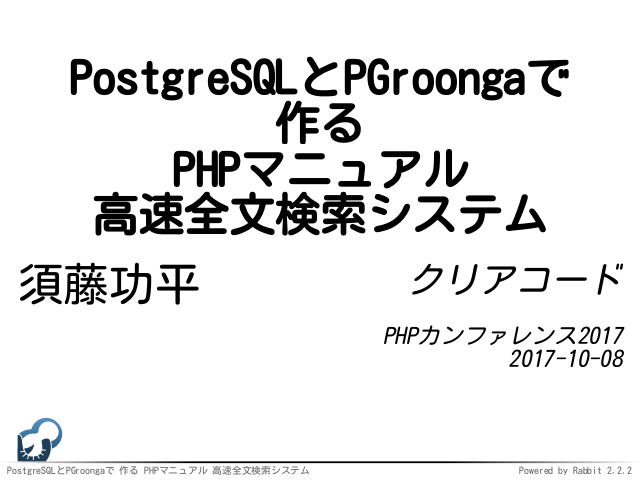 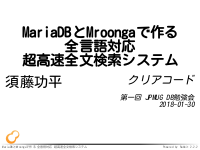 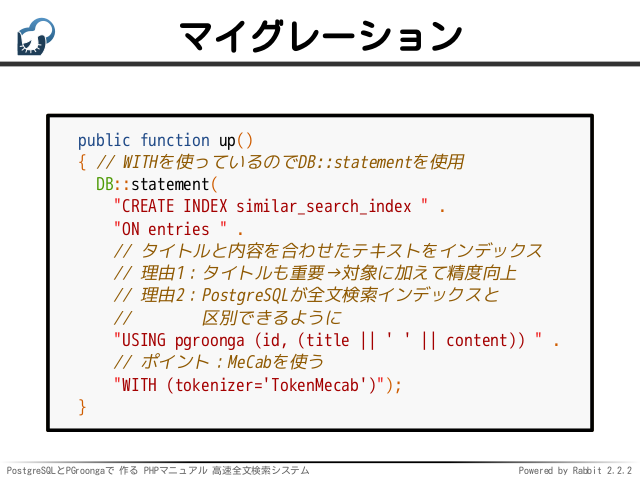 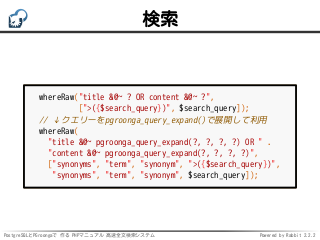 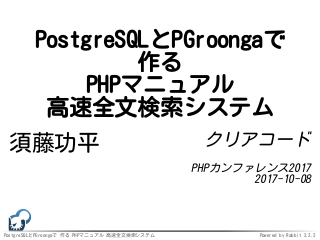 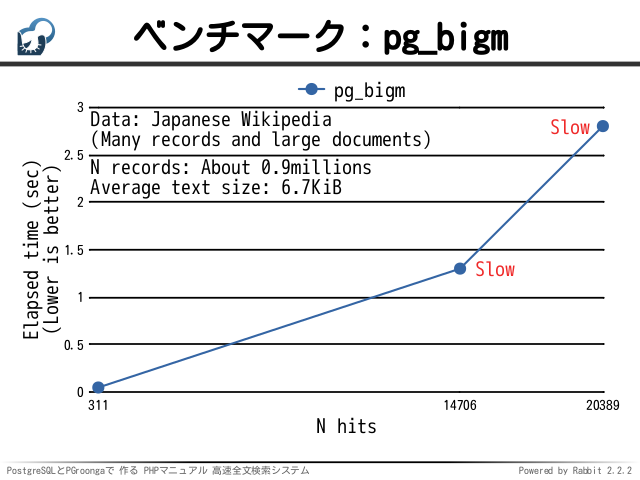 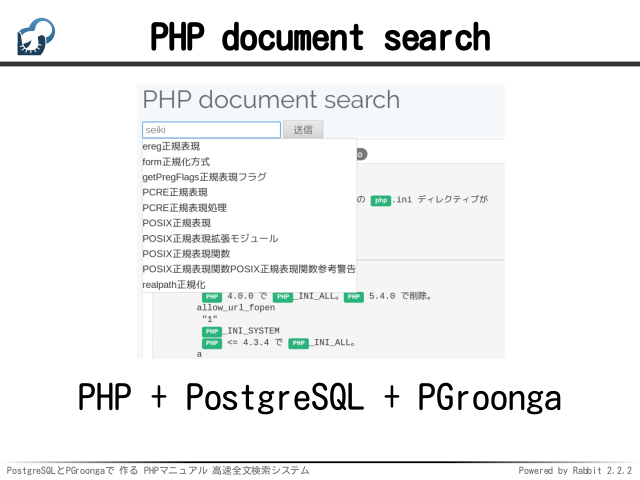 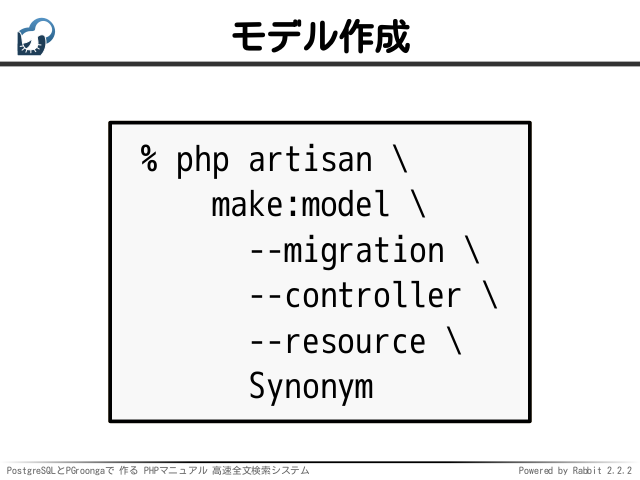 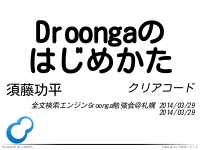 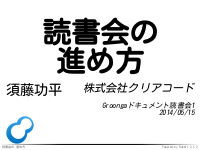 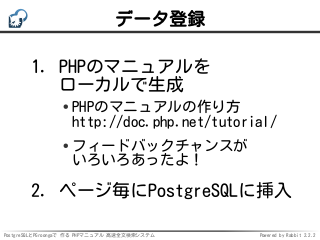 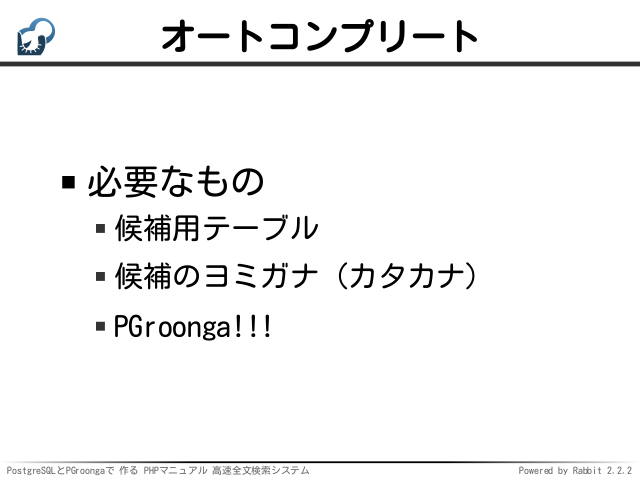 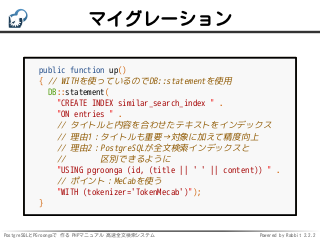 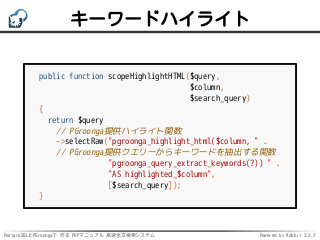 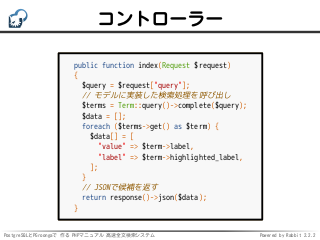 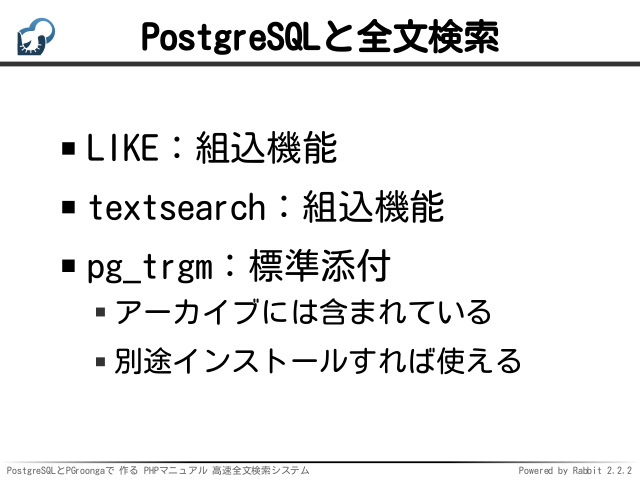 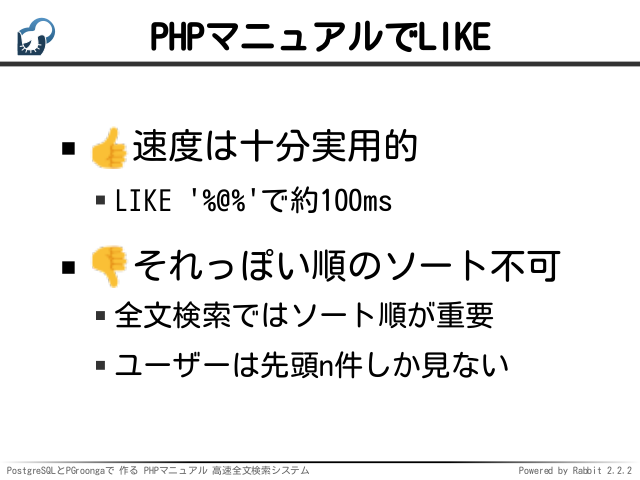 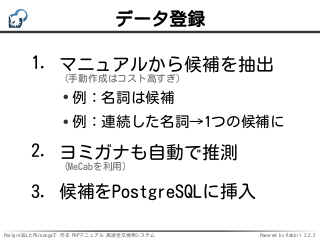 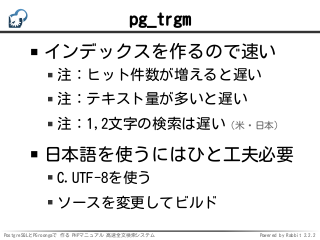 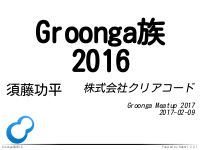 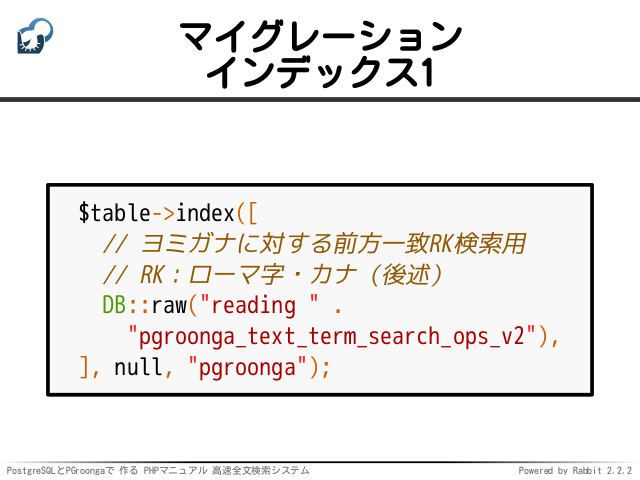 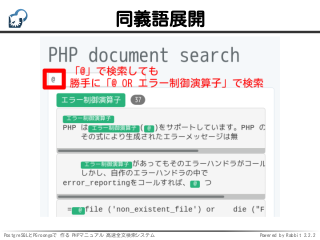 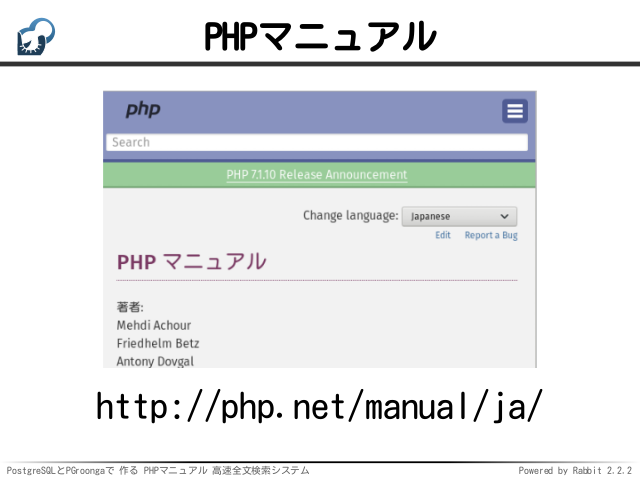 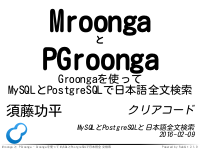 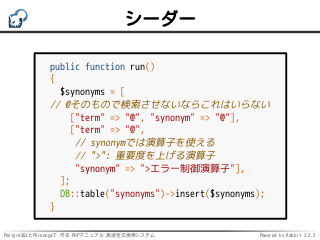 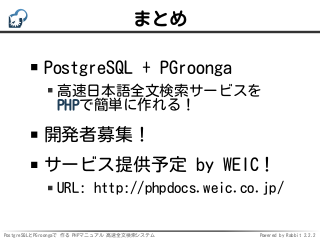 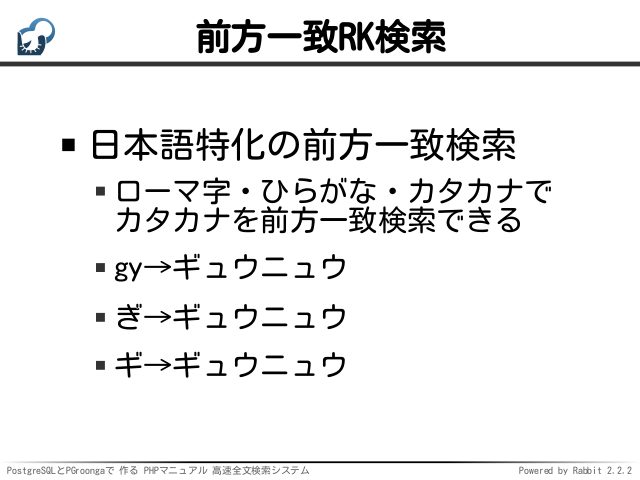 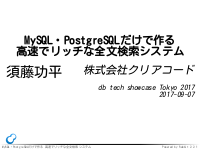 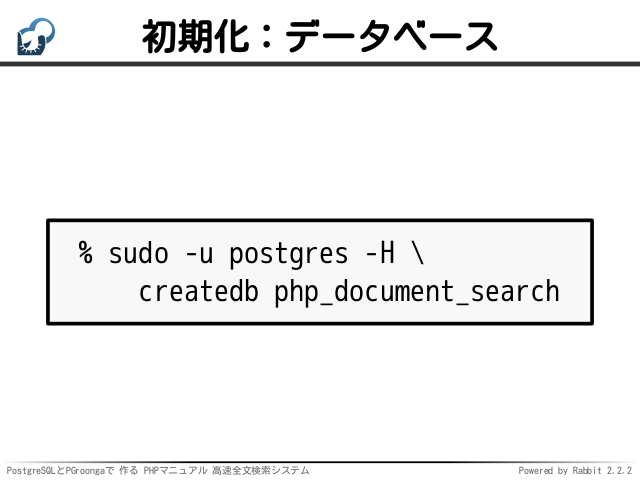 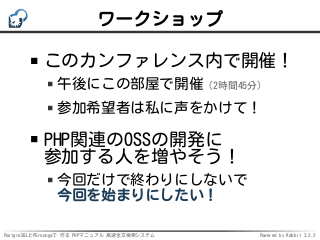 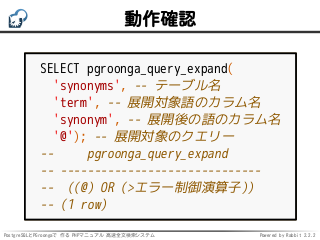 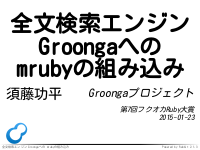 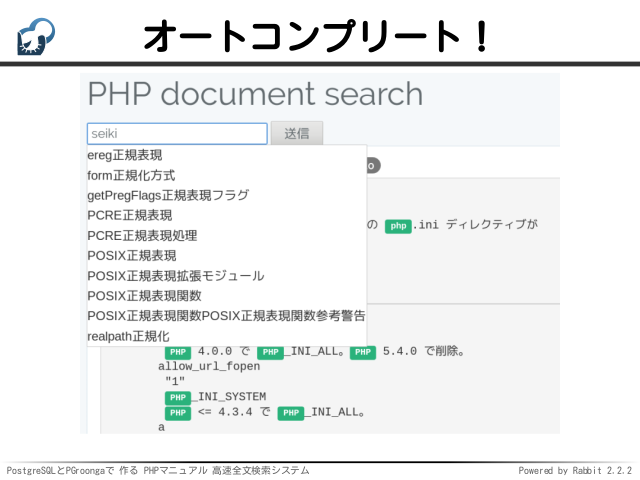 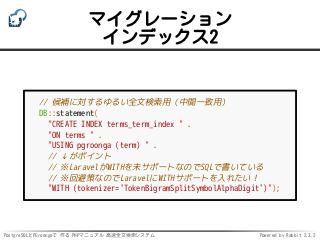 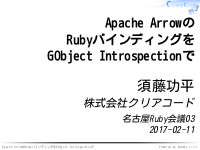 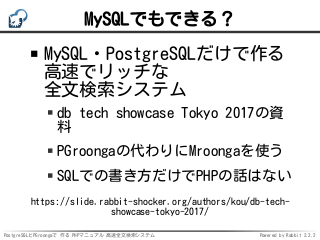 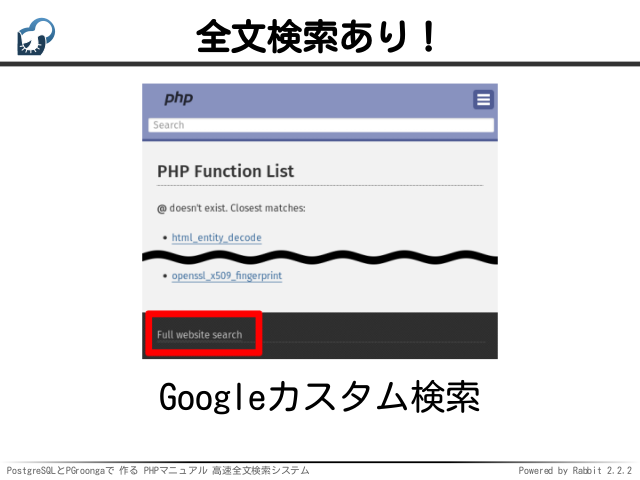 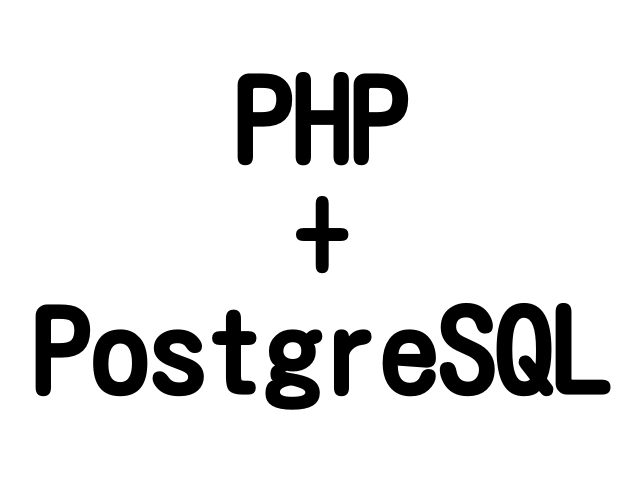 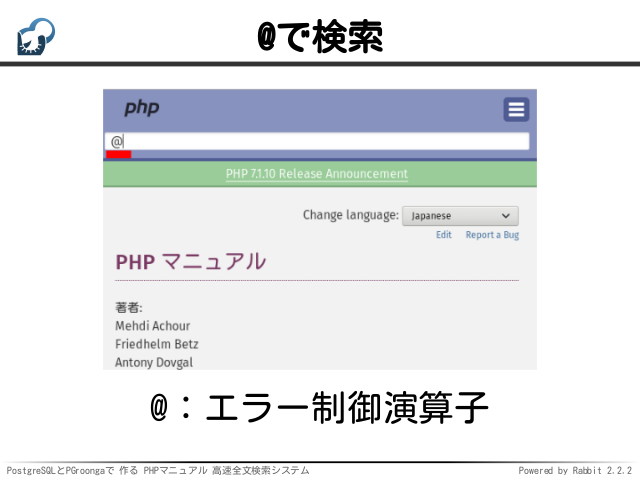 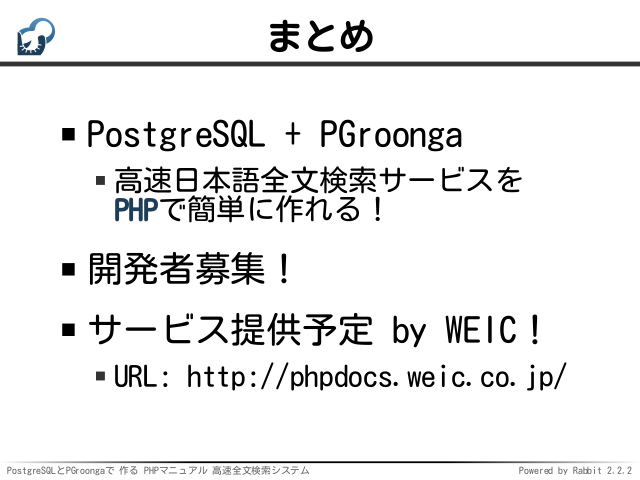 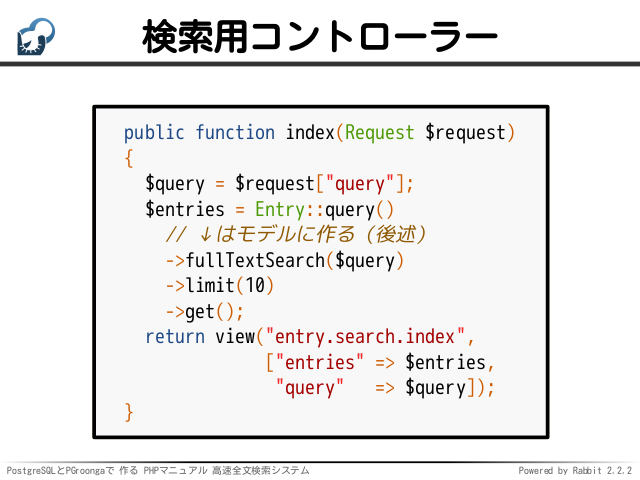 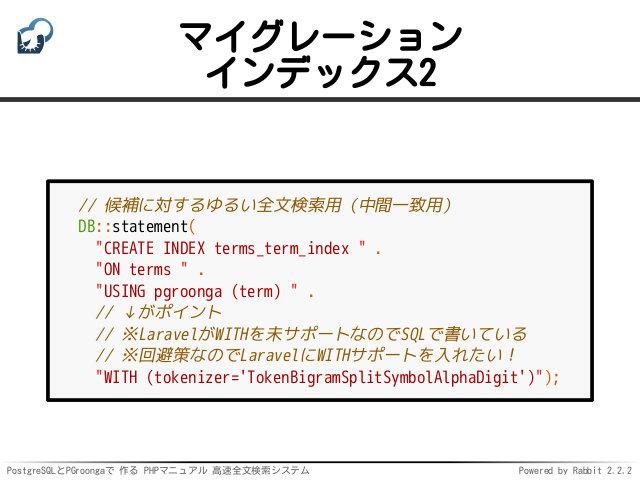 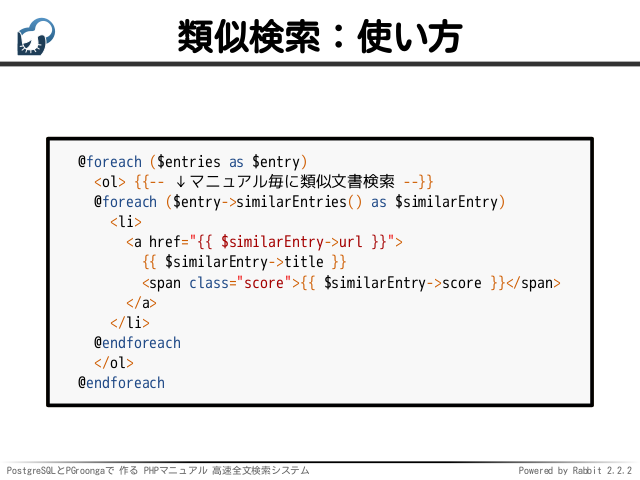 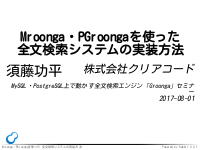 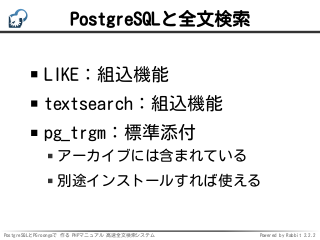 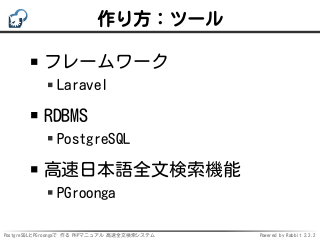 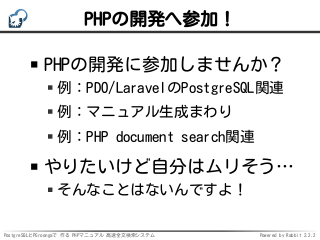 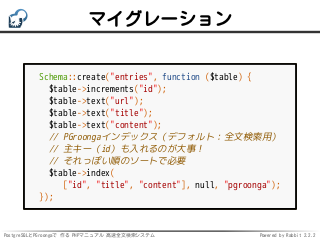 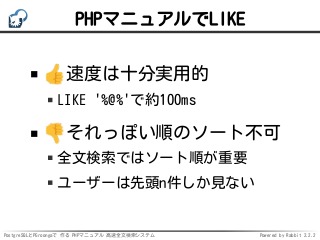 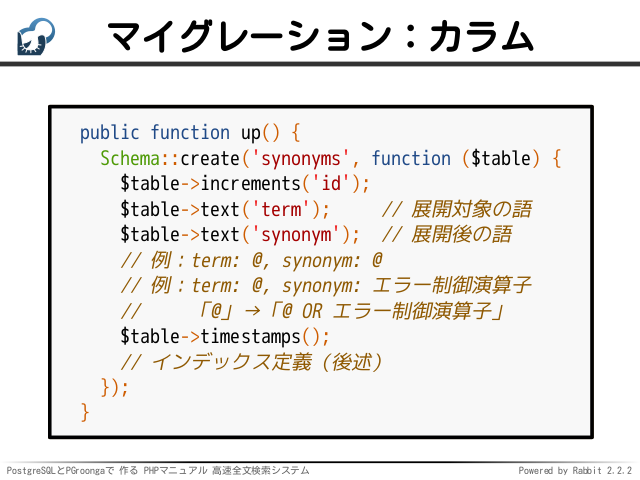 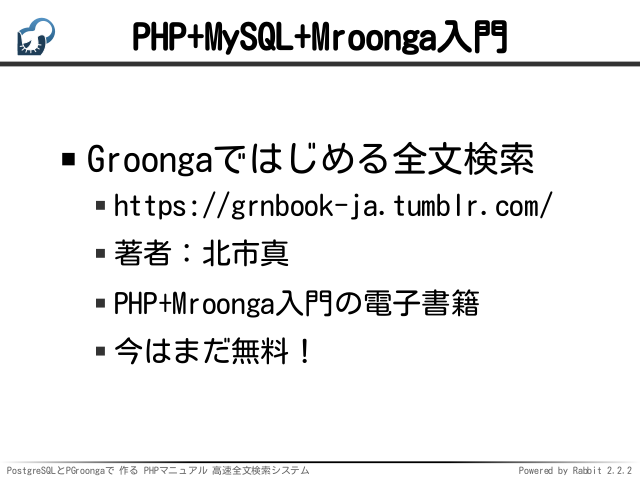 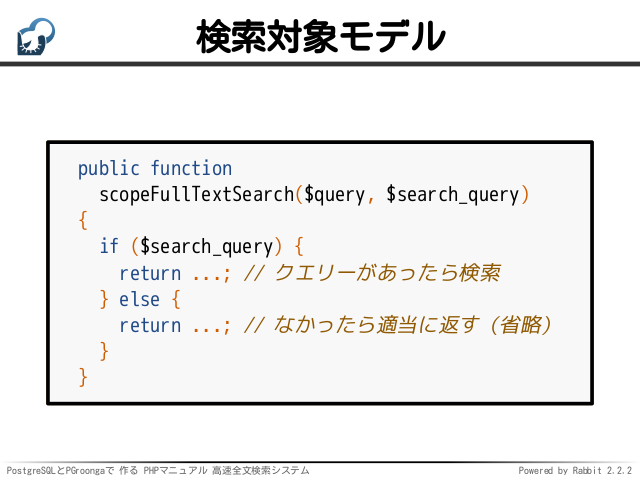 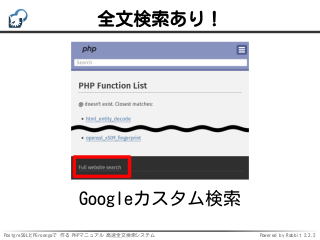 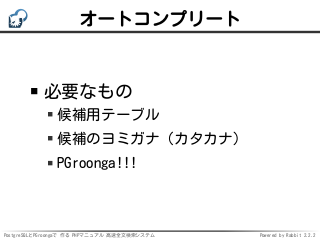 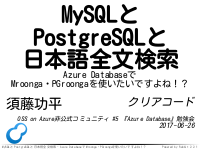 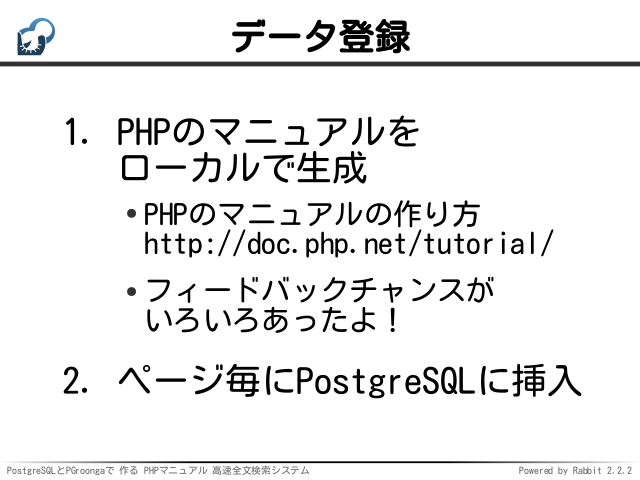 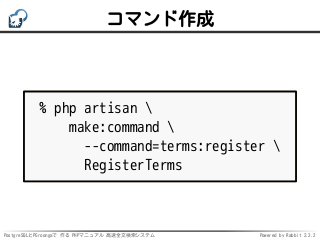 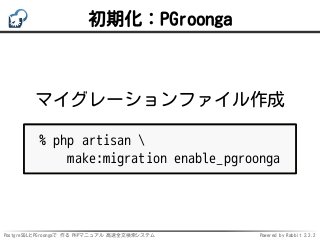 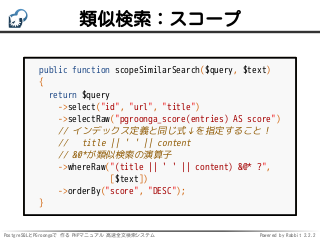 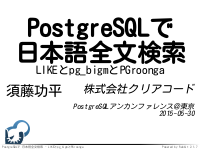 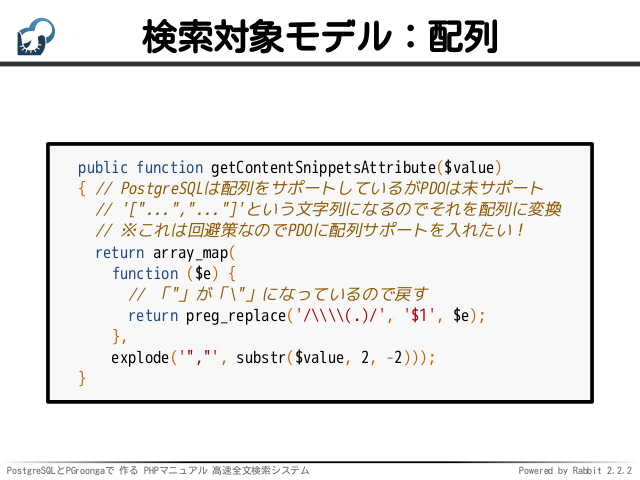 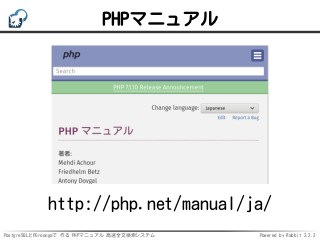 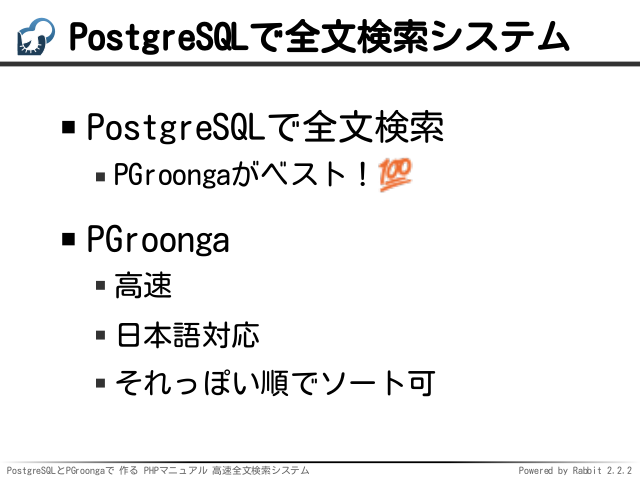 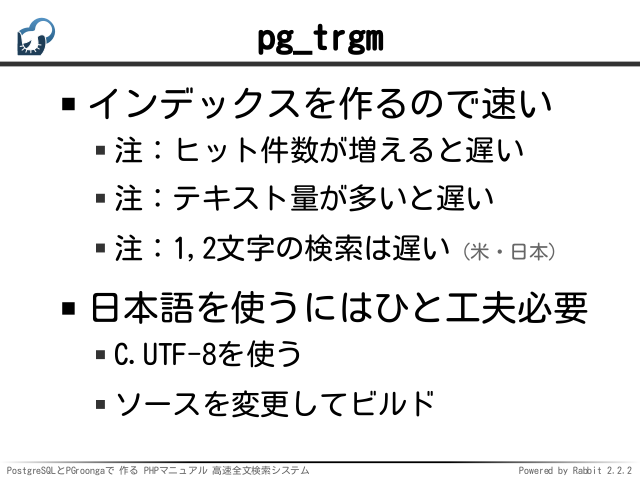 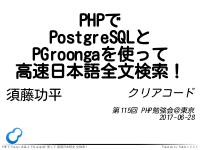 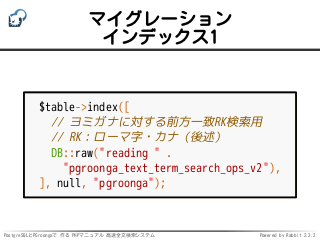 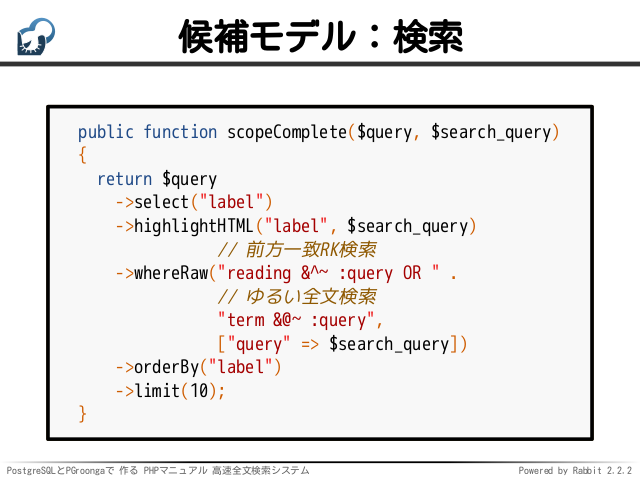 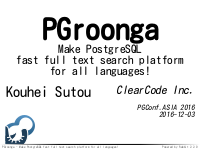 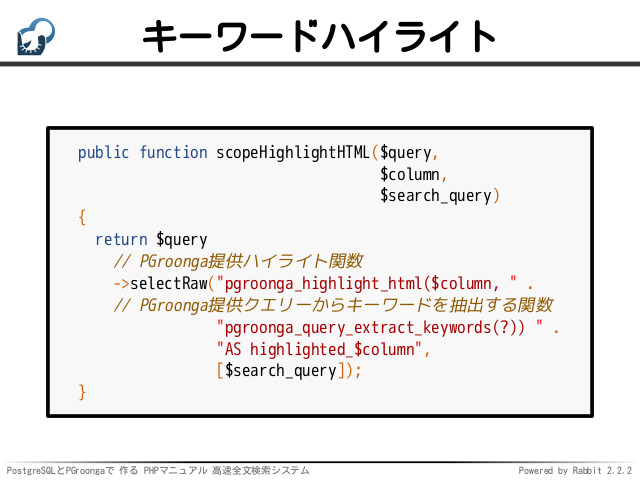 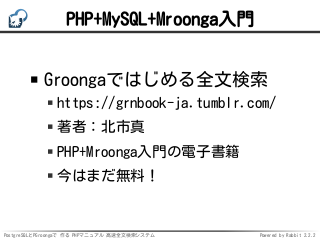 "USING pgroonga (term) " . 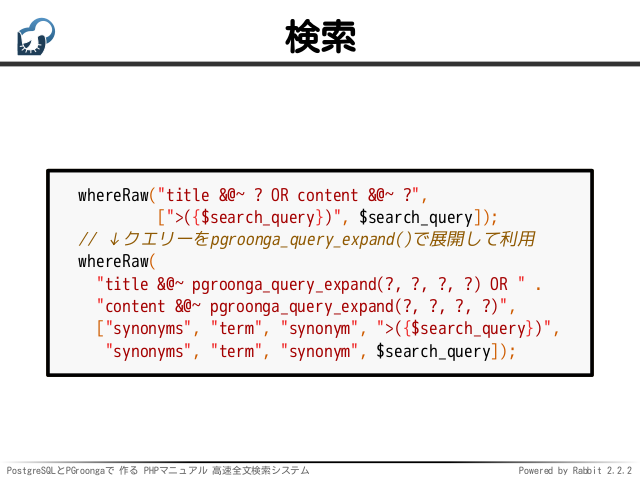 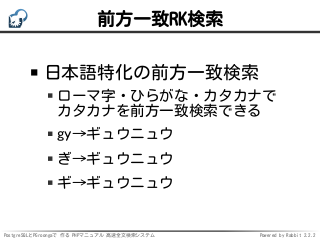 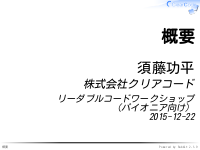 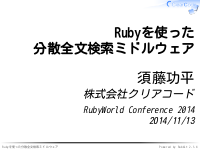 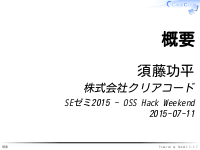 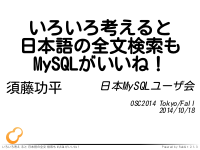 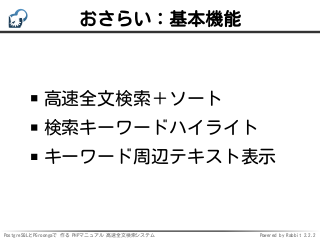 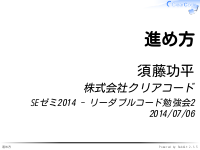 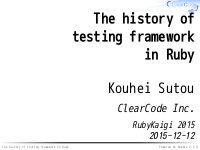 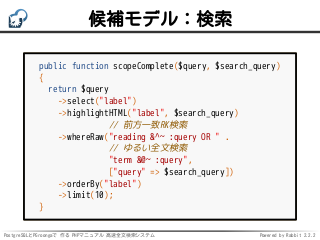 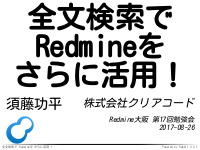 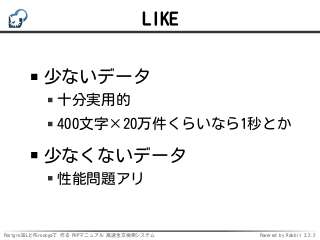 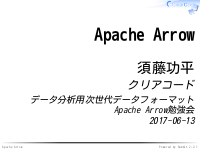 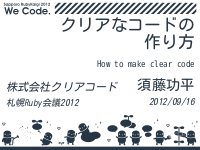 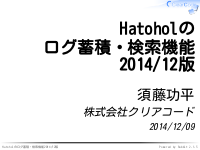 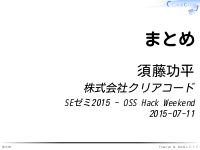 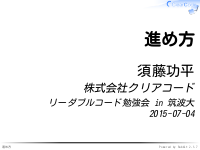 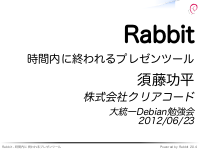 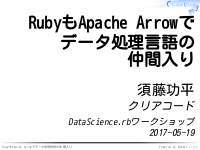 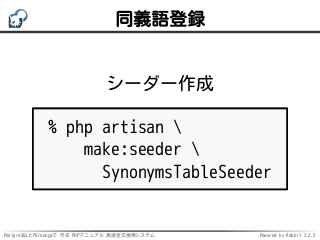 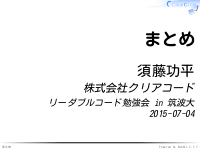 ->whereRaw("reading &^~ :query OR " . 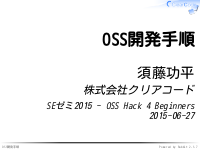 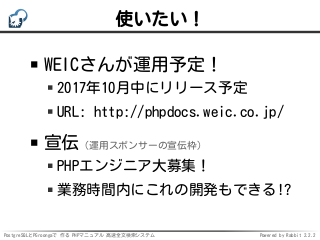 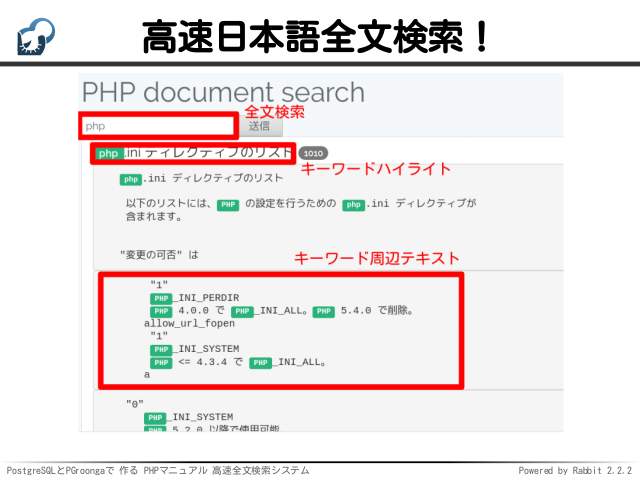 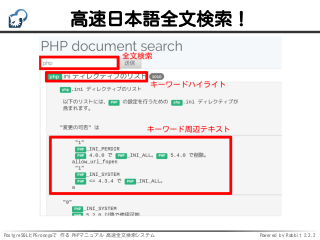 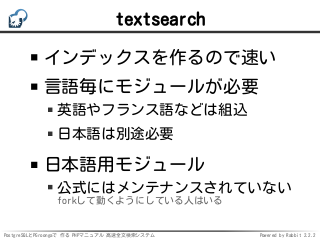 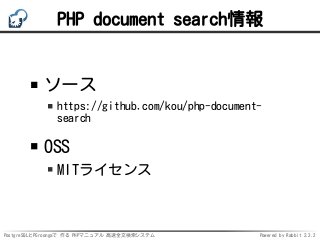 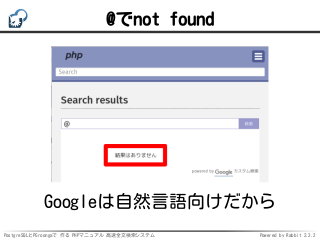 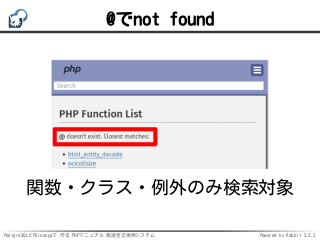 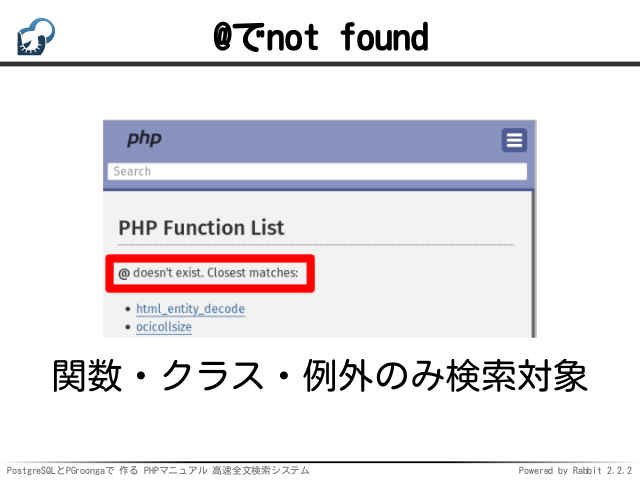 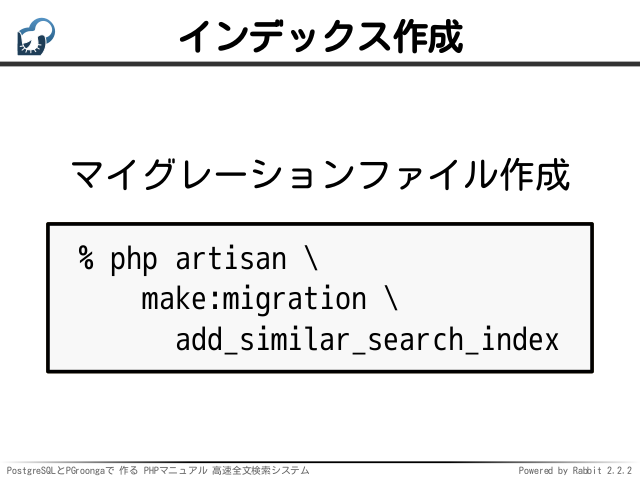 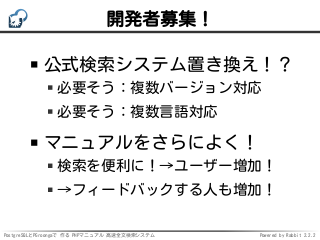 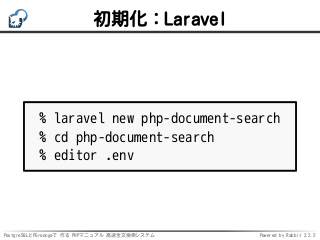 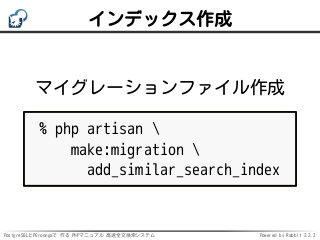 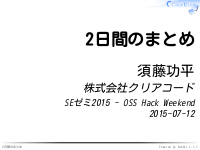 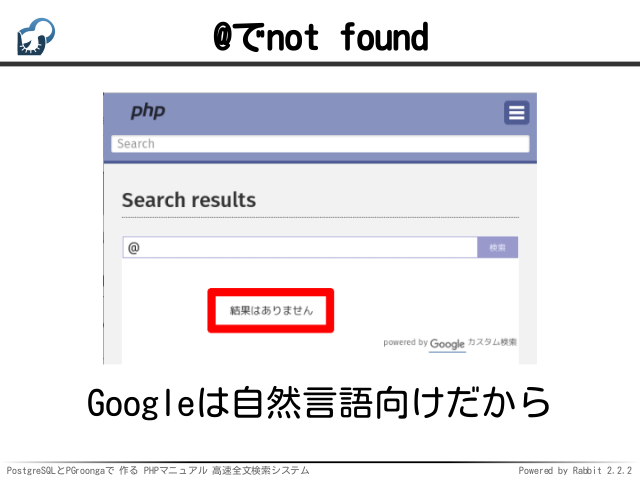 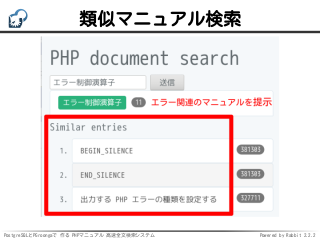 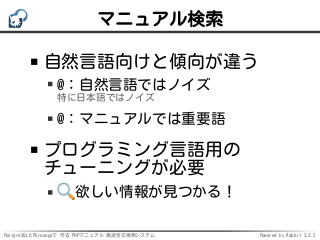 "CREATE INDEX similar_search_index " . 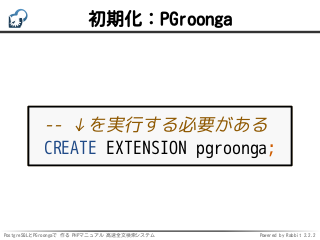 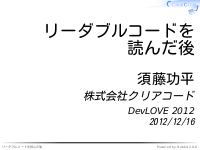 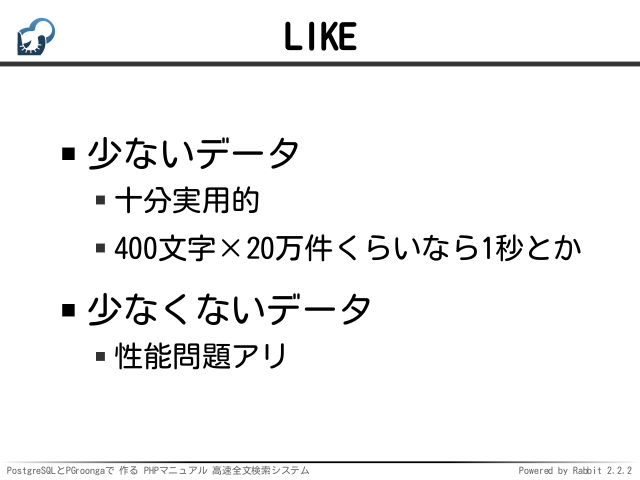 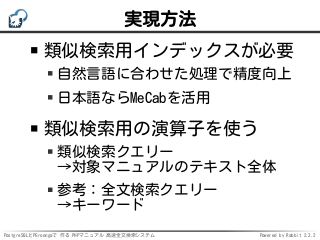 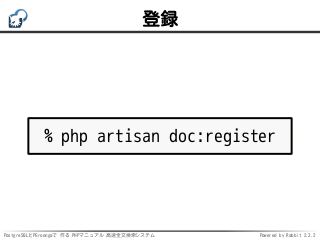 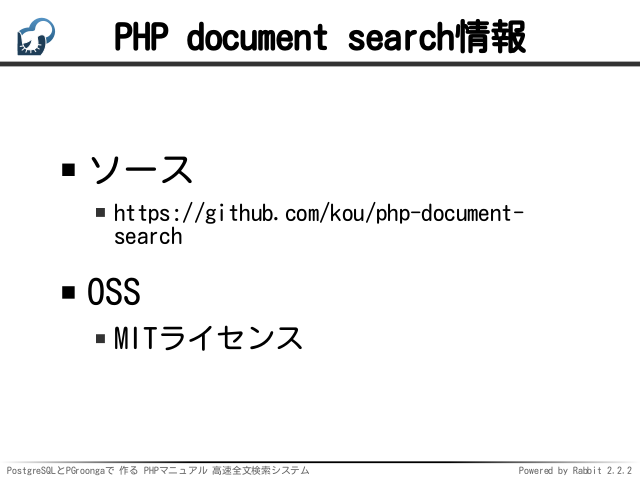 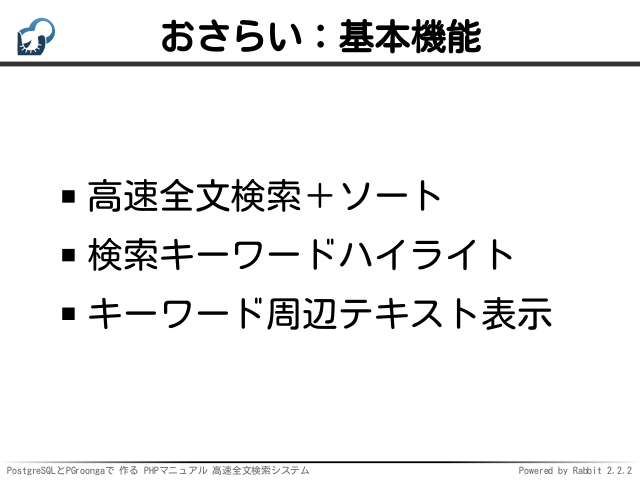 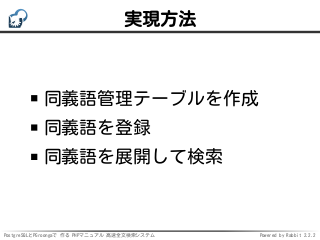 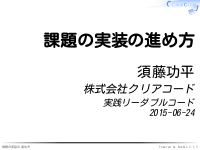 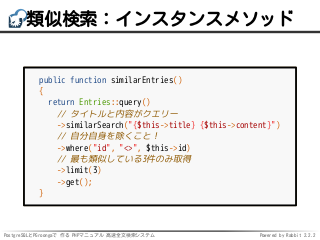 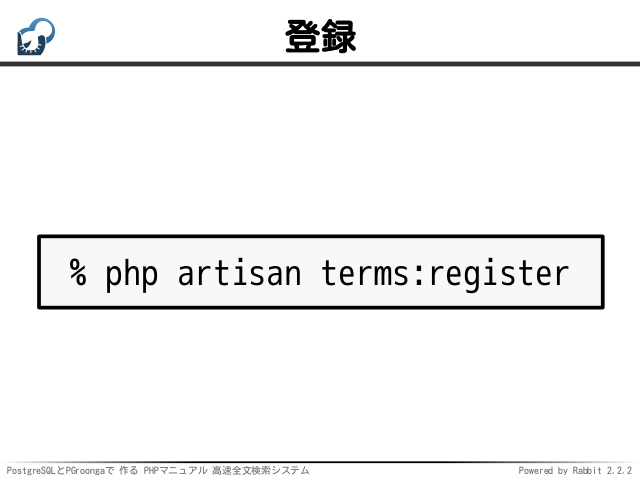 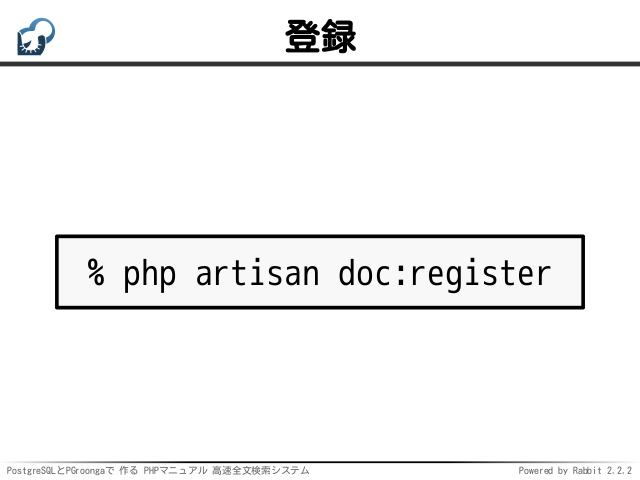 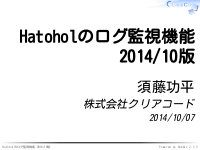 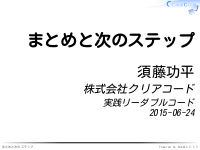 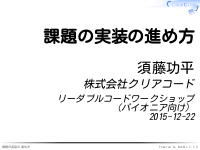 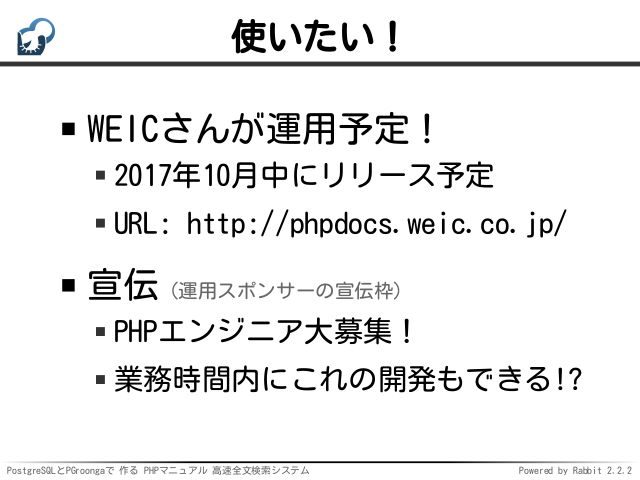 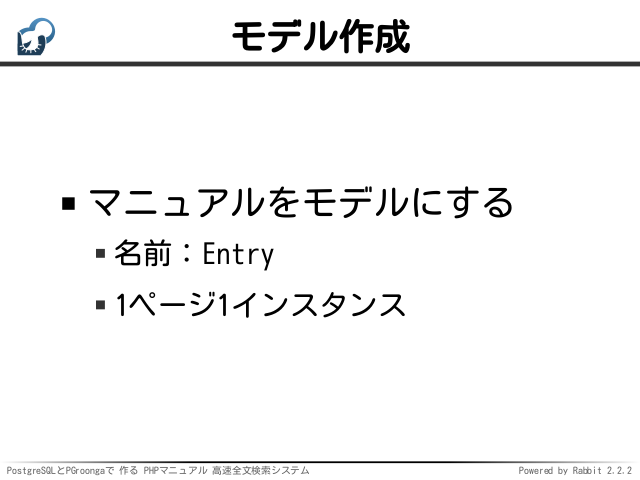 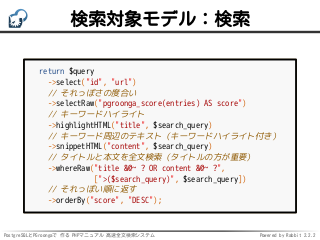 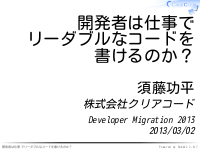 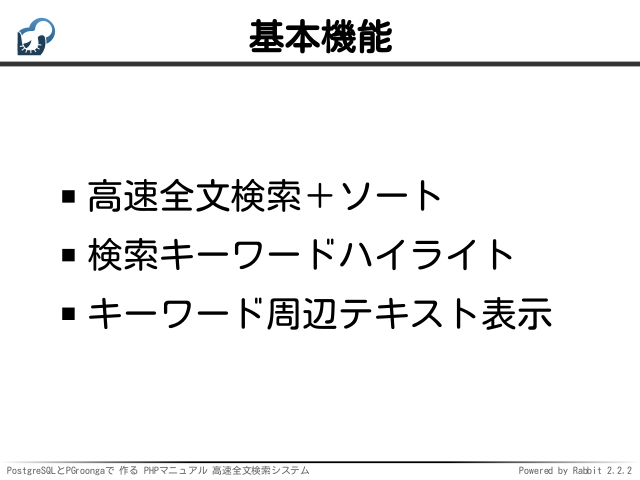 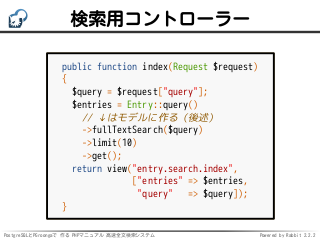 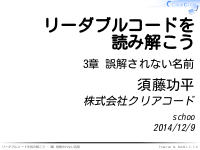 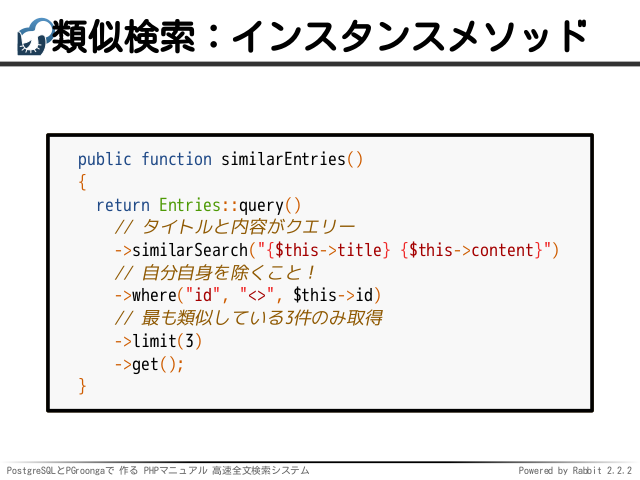 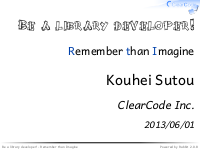 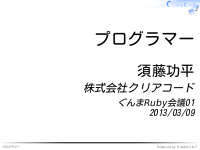 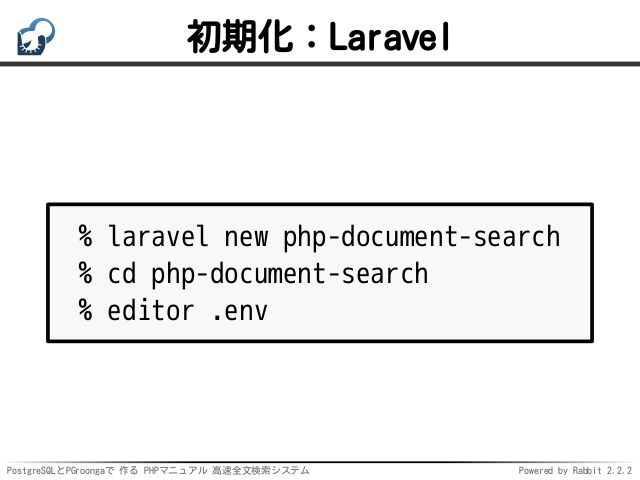 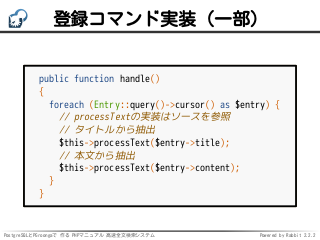 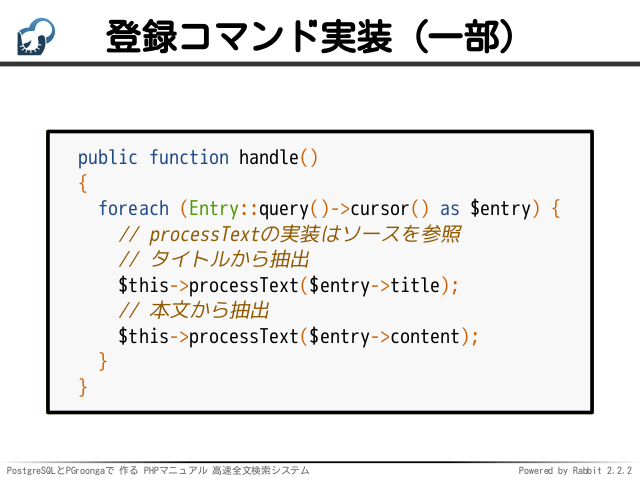 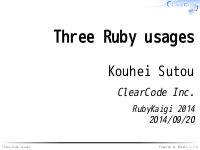 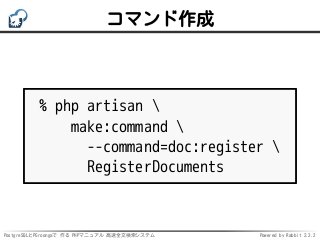 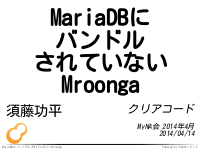 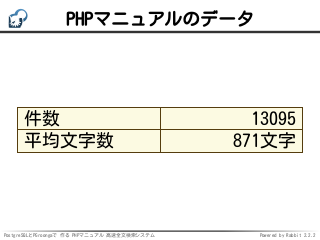 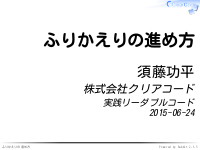 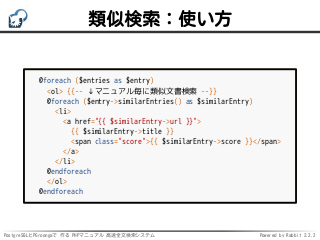 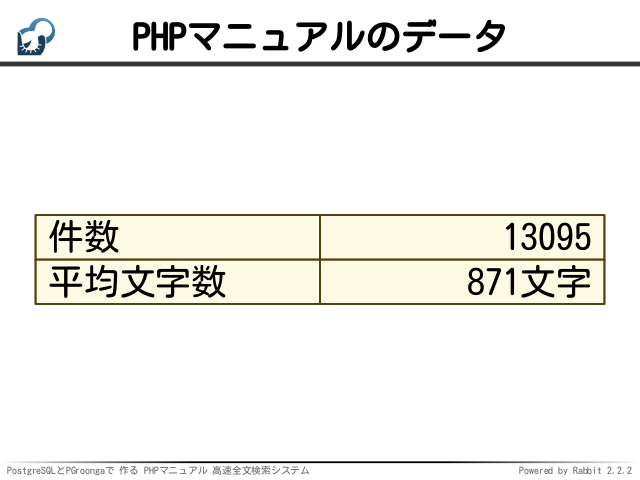 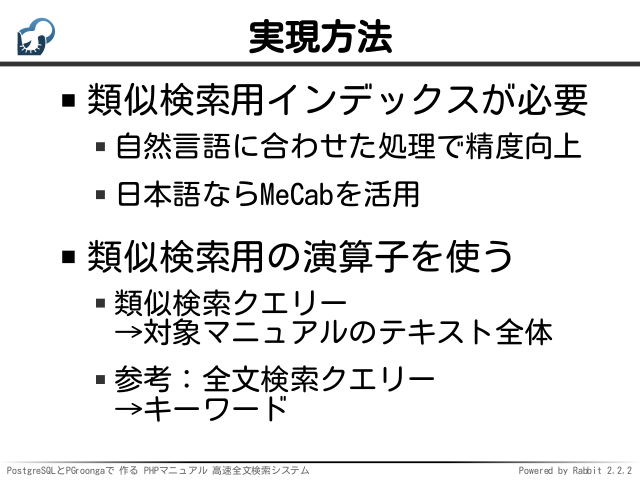 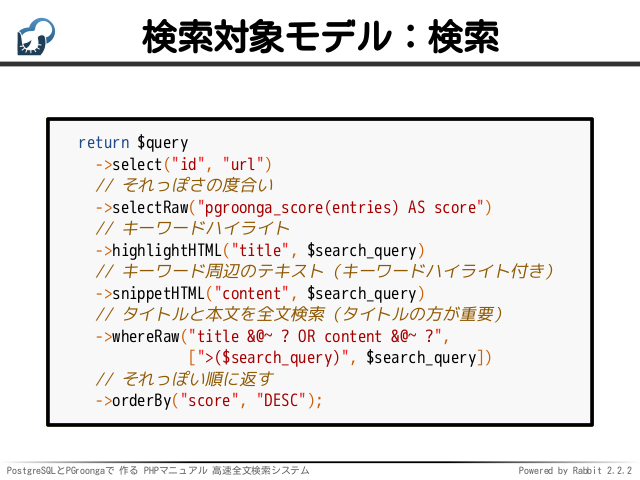 "USING pgroonga (id, (title || ' ' || content)) " . 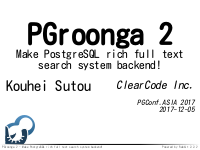 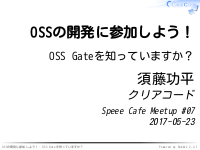 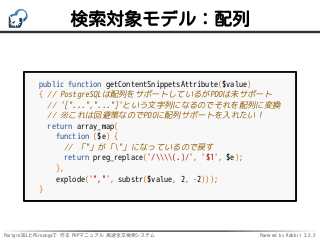 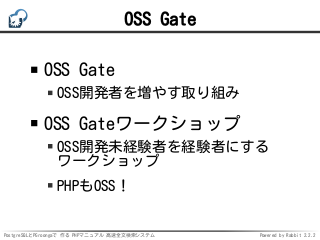 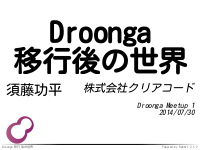 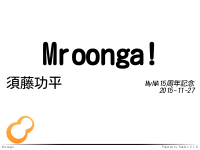 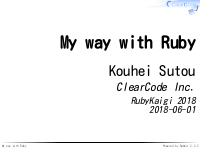 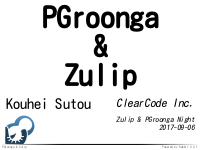 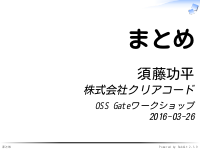 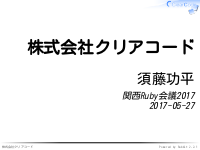 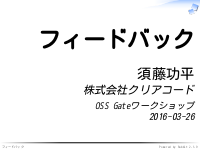 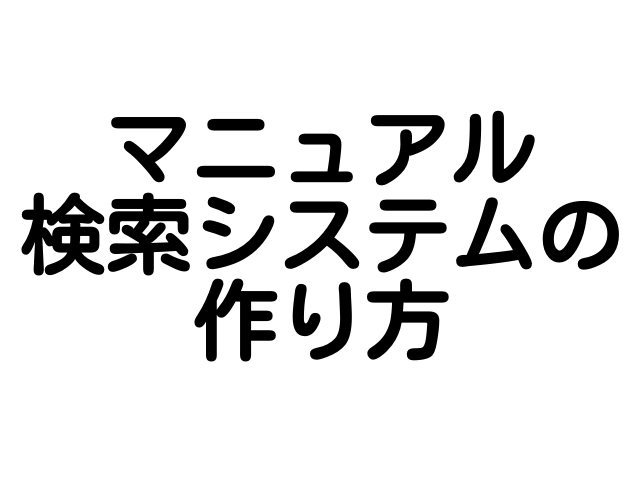 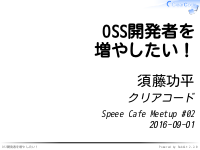 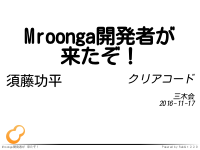 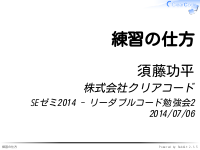 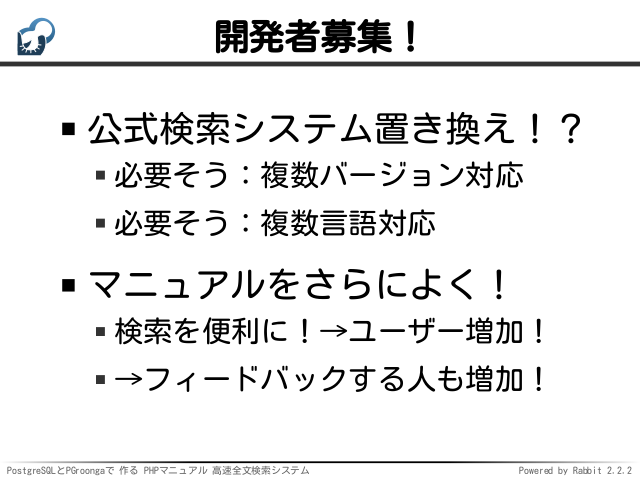 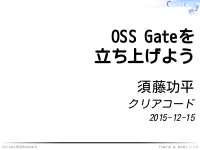 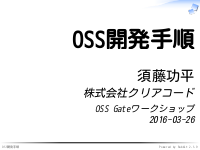 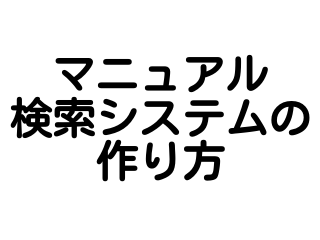 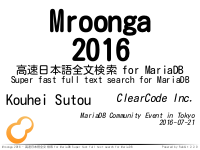 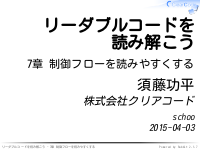 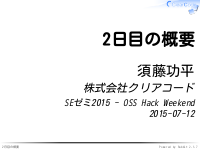 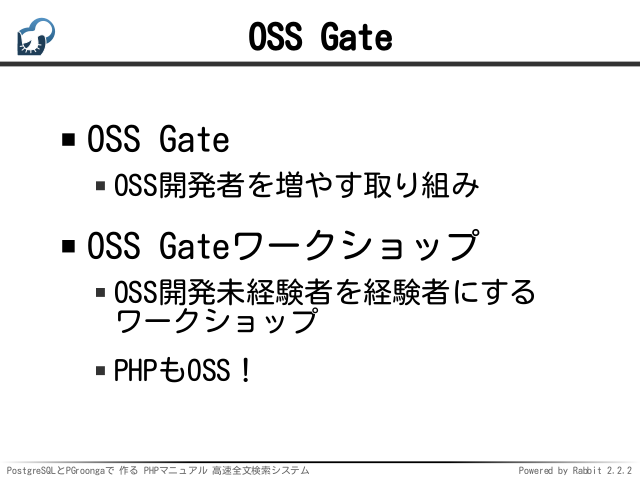 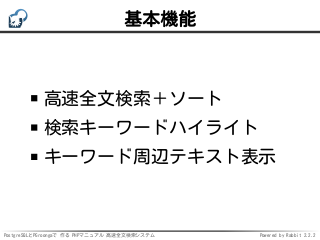 "title &@~ pgroonga_query_expand(?, ?, ?, ?) 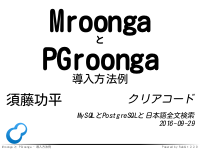 OR " .